Have you ever wondered about the food you eat? Have you ever thought that what you eat says something about who you are, where you come from, and what you believe? 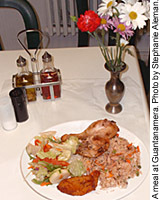 All over the world, foods are associated with different groups of people. In Wisconsin, that’s true too. Think of corn with Oneidas, wild rice with Menominees, lefse with Norwegian-Americans, or bratwurst with German-Americans. Let’s find out about foods linked with a group that more recently came to Wisconsin: Cubans. We’ll do that by meeting two Cuban-Americans. Panama, Chile and Argentina. Everyday they made food and sold it from the back of a food truck. They worked as caterers for many years helping to organize large events where food would be served. Yolanda and Mario specialized in preparing and serving Cuban food. Yolanda originated from the island nation of Cuba, in the Caribbean. She grew up in the capitol city of Havana in a neighborhood called Miramar. She learned to cook from her grandmother and mother. A great change took place in Cuba when Yolanda was a young girl in the 1950s. Everything became different. The way people bought their food, the foods that were available, and the way people ate changed too. This was all part of a new way of living called socialism. Socialism was a new political and social system for Cuba. It changed the ways the Cuban government and the economy worked, and how people went about their daily lives. The roles for women changed so that more women worked outside their homes. Now they spent less time cooking at home. Yolanda changed too. She began to develop strong ideas about cooking and food preparation from the changes she saw around her. When she left Cuba with her husband Mario, Yolanda believed in making low-cost nutritious meals for workers and students, meals made from simple, but recognizably Cuban ingredients. When Yolanda and Mario set up their first food truck on a beach in Argentina, it was not the tourists that came to eat there. Their customers were the many workers from around the area who visited them day after day. 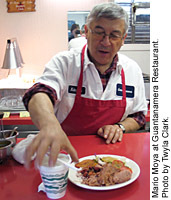 Yolanda and Mario’s style of cooking appealed to regular, hard-working people. When they moved to Madison, Wisconsin, the couple decided to open a restaurant that reflected this style. 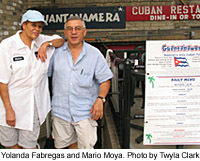 Mario and Yolanda named their small, simple restaurant Guantanamera. They named it after a well-loved Cuban song. 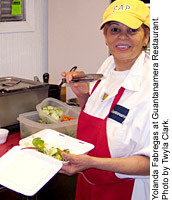 Yolanda and Mario thought even people who were not Cuban would recognize Guantanamera as a special Cuban name. Along with the restaurant, they opened a food cart on the University of Wisconsin Library Mall too. Yolanda and Mario became part of the Madison community by offering good, simple food at a low cost to University of Wisconsin students and workers who work near the Capitol Square. Hungry to know more about their cooking? Find out on the next page!